Fantasy fiction has always been my primary writing genre, but historical fiction is a close second. My obsession with learning about different periods of history and different cultures ties in to my love of learning about different religions and folklore. Quite a bit of research was done on my part to create the unique rules of magick and the religion/folklore in Love of the Sea. One of the resources I used was “The Secret History of Mermaids and Creatures of the Deep” by Professor Ari Berk. This was actually a book I picked up from one of my visits to the Chicago Shedd Aquarium, one of my favourite local museums. Many aspects of mer life and lore were inspired by this particular book, and also was pushed me to create more illustrations for my writings. This illustration is what largely inspired the caves that Asrai and Illyana live in while in exile. I imagined that they would use both magick and found items to decorate their cave dwelling to make it homey and comfortable. 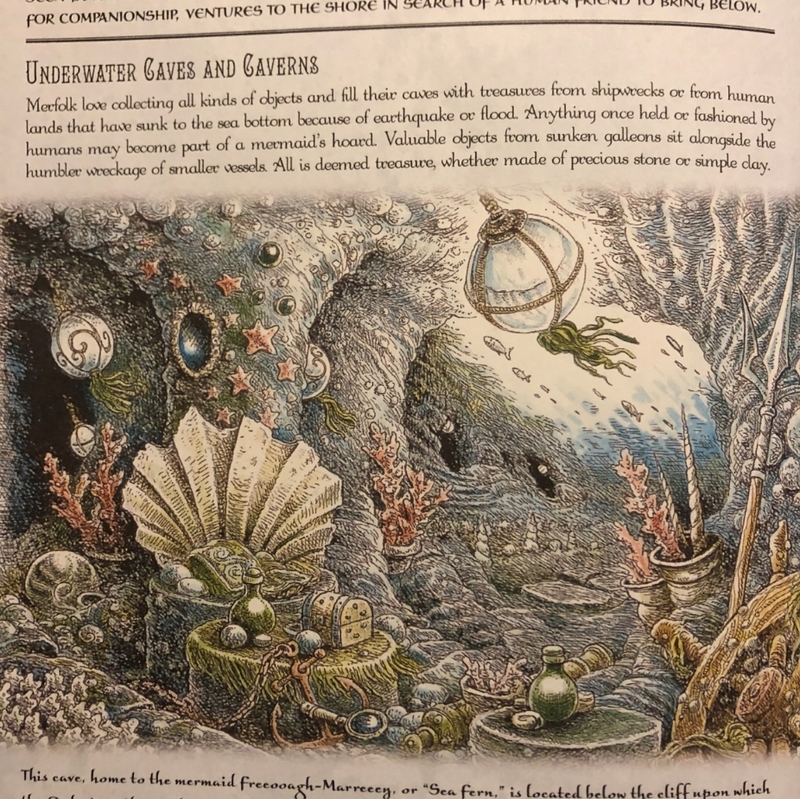 The glass fishing floats in the illustration are what inspired the idea of using captured bio-luminescent sea creatures in glass floats for the mer version of electricity. It also inspired the dragon-like greed for treasure that I instilled in my mers, showcased by Illyana taking Cormack’s ring from Asrai, and from Asrai paying more attention to fine jewelry than the clothes she is given for the wedding. 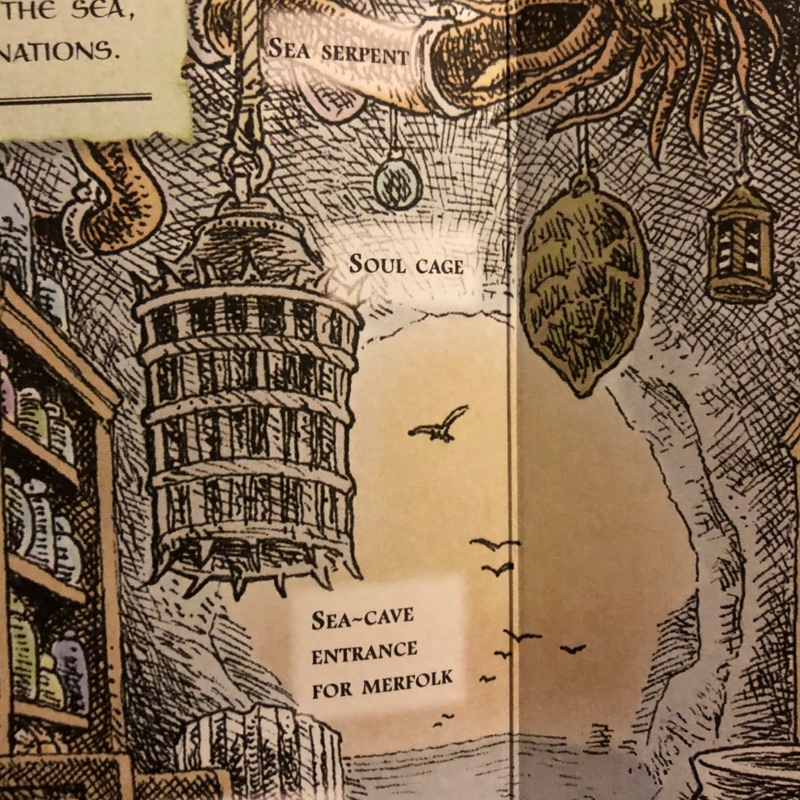 Though this is a small detail in an illustration, this particular note is the driving force behind the idea to trap Cormack’s soul in Love of the Sea. The idea of mers using dark magick like a “Soul Cage” plays to my desire to separate their behavior further from humanity and showcases the dark side that lore and magick can harbour. Many types of ancient folklore illustrate mers and mer-like creatures as hungry predators that eat humans as food, or use them as playthings for their cruel games. I wanted to play on this in Love of the Sea, without going as far as the malicious and predatory behavior of Greek sirens. I believe these distinctions that make Asrai more mer than “human” help to set Love of the Sea apart from traditional modern mermaid stories, which was my ultimate goal with this novel. Love of the Sea is available on Amazon! Tags: fantasy, lore, love, mer, mermaid, of, sea, the. Bookmark the permalink.